Like last time we will have prize tiers that can be unlocked with certain amounts drank in total by everyone in the contest the more drank the better the prizes will be. All drinking needs to be done on the mused region to count toward the contest. Hope you all have a great St. Patrick’s Day and don’t forget about our pot of gold treasure hunt that we have going on for some St. Patty’s day goodies! And don’t forget that we are looking for a pinup for March! I have heard rumor that a leprechaun has taken up residence on :mused: and with him comes his pot of gold. From now until the end of march you can find it hidden somewhere on region. When you find it he will give you one of his gold coins that has some St. Patrick’s Day themed goodies inside it. Two :mused: milkmade tube top /peekaboo appliers and a t shirt that will work with both milkmade and full breasts. 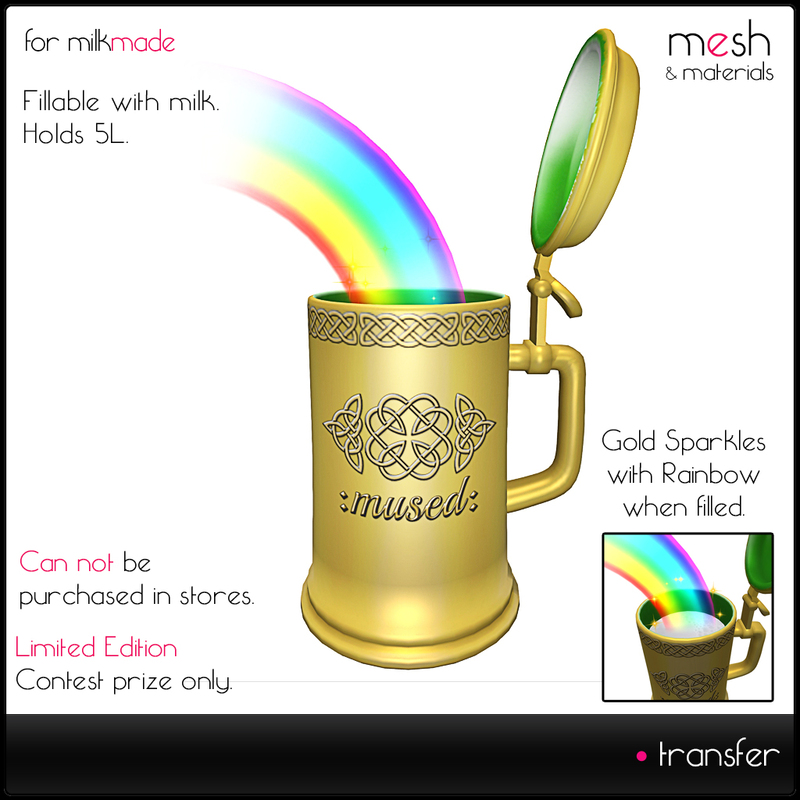 The pot of gold will be somewhere on ground level, you will need to click it and it will give you, your coin. I wouldn’t be surprised though if the leprechaun hid it again once someone has found it, but you shouldn’t find it in the shop leprechauns prefer open skies and green things.